The model I purchased came with a 20 round magazine (and I'm sure that will come in handy when shooting zombies), but I also purchased separately a 5 round magazine for hunting. If I were to say anything negative about the FNAR, it would have to be the magazine costs. 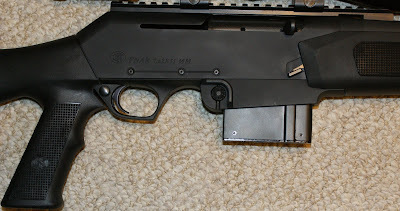 Why they didn't use another standard magazine, I will probably never know. The 5 round magazine cost me $82.07 after shipping and handling. Since they were hard to find, and I didn't want to risk it later in the year, I went ahead and got one from Scottsdale Gun Club. The photos below show both clips side by side and each in the gun. Based on doing some research in magazine costs, it looks like the costs are starting to come down. I have seen the 20 round magazines for about $50. At that time, I didn't realize what a good deal that was, so I missed out and have never been able to find them again for that price. Bottom line is that I will get at least two more 20s when I find a good deal. Overall, I would have to say that the magazines seem solid as a rock. Unfortunatly, I still have not been to the range, but expect them to function flawlessly. Before I received the 5 rounder, I had a little concern about the 5 round magazine looking too militant. My impression now is that it is just the right touch. It helps let your hunting buddies know that you're not an average Joe, but at the same time, the profile is not out of hand when it comes to practicality. I'm sure someone will give me some slack about the need for more than one bullet when deer hunting, or the need for a quick second shot. Honestly, I agree as long as you are not talking about a herd of wild hogs or pack of coyotes. So in the end, my thoughts are prepare for the worst and the norm will be a piece of cake. Have you seen any 10 rounders for $50? If FN has a patent on this, I expect the prices to stick around $40-$50. Kinda like buying a cheap printer and getting screwed on the ink. The best price I have found is for about $65. 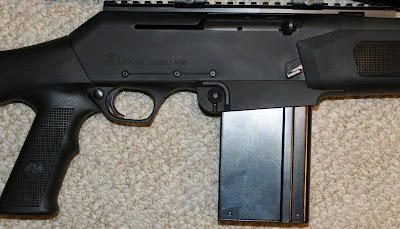 The good thing is the Winchester SX-AR uses the same mags. I think the price will always stay high, but I think that in the $50s is a more appropriate range.